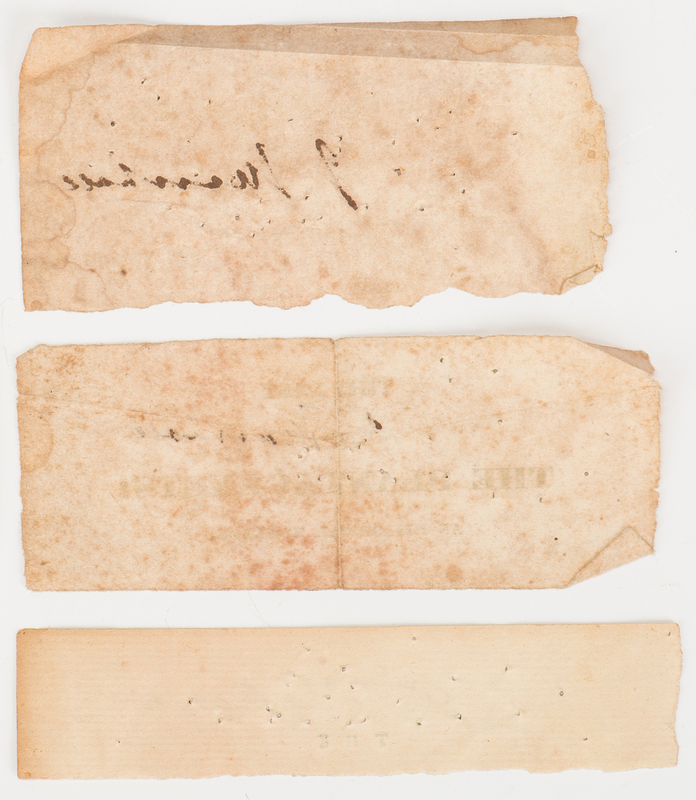 1st-3rd items: Three (3) cut book pages with signatures including one (1) George Washington and two (2) John Marshall. COAs from Stuart Lutz Historic Documents, Inc. will be provided for this lot. 1st item: George Washington (1732-1799) cut signature from the title page of an unidentified book, undated. Ink signature reads "G Washington" top right. 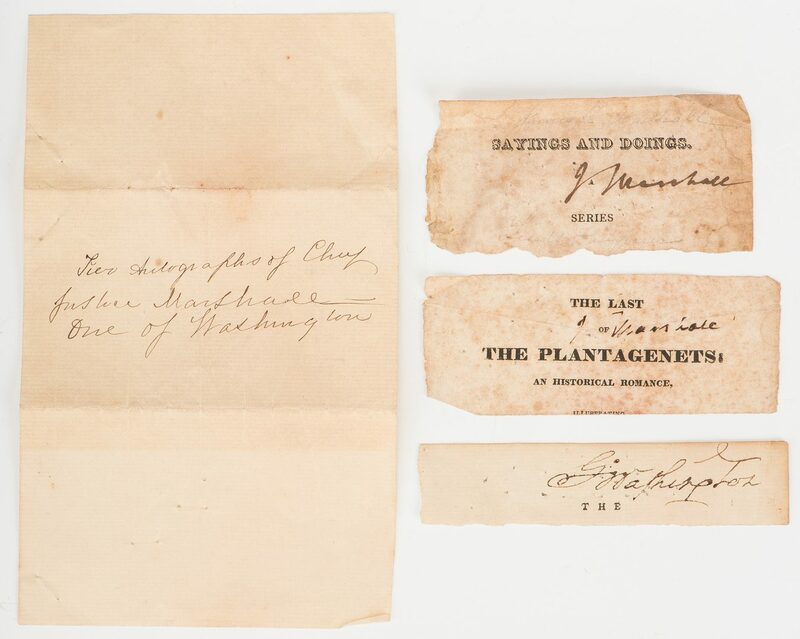 1 1/4" H x 4 7/8" W. 2nd item: John Marshall cut signature from the title page of "Sayings and Doings. A Series of Sketches from Life" by Theodore Hook, 1824. Ink signature reads "J Marshall" center right, with additional light pencil signatures by James Keith Marshall, John Marshall's son, reading "James K. Marshall Leeds Fauquier" top and bottom center. 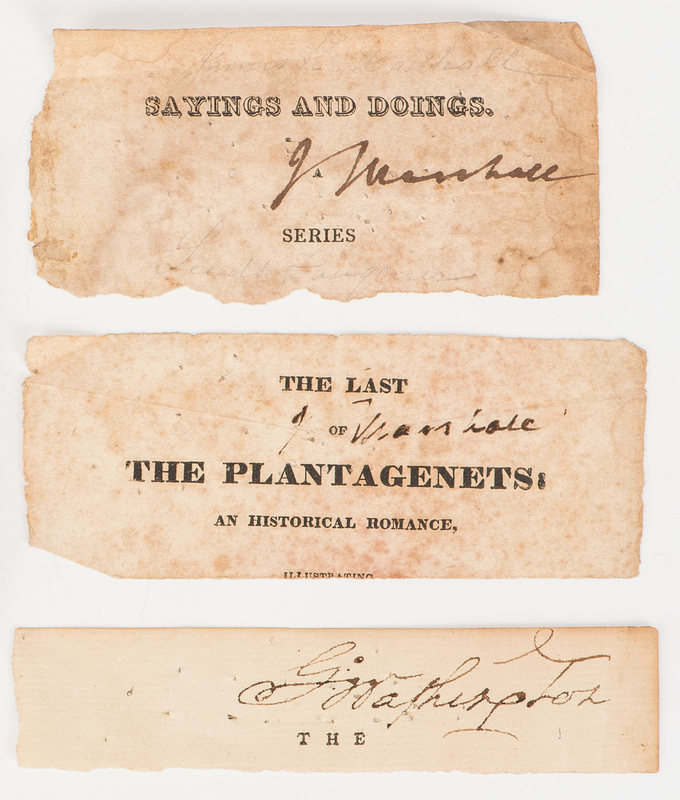 2 1/4" H x 4 1/4" W. 3rd item: John Marshall cut signature from the title page of "The Last of the Plantagenets: An Historical Romance" by William Heseltine, 1829. Ink signature reads "J Marshall" center right. 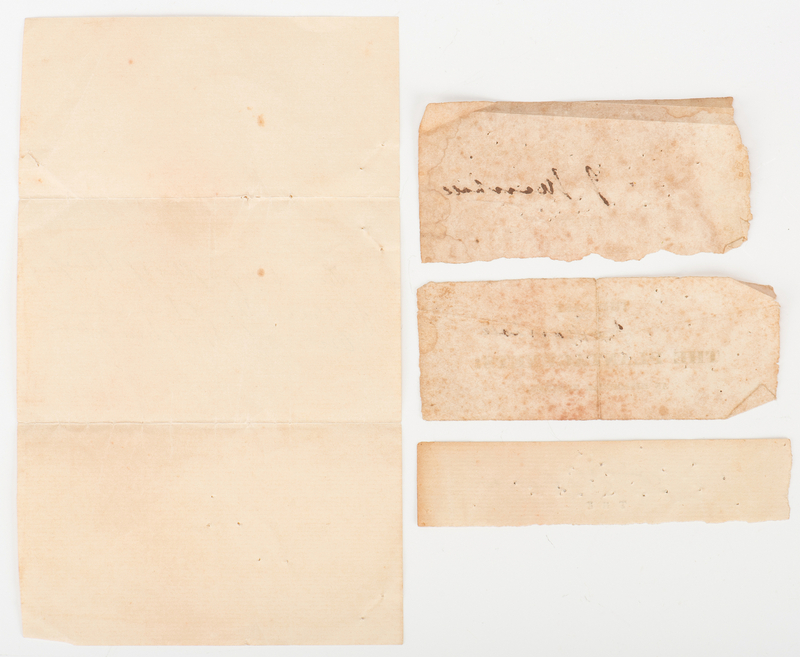 1 7/8" H x 4 5/8" W. All signatures accompanied by a leaf of folded laid paper identifying them as "two autographs of Chief Justice Marshall one of Washington" in 19th century script. Note: Marshallís ancestor William Marshal, 1st Earl of Pembroke (1146 or 1147-1219), also called called William the Marshal, was an important figure in the development of classic knighthood during the reigns of Plantagenet kings Henry II, Richard I, John, Henry III, and Geoffrey Plantagenet, Count of Anjou. The ìLe Mareshalsî accompanied William the Conqueror during the Norman conquest of England in 1066. (courtesy: Robert L. Hawkins, III). Note: James Keith Marshall (1800-1862) was a Virginia planter and politician. He served in the Virginia General Assembly as a delegate and as a state Senator, including after Virginia declared its secession during the American Civil War. John Marshall (1755-1835) was the Fourth Chief Justice of the United States and also served as Secretary of State under John Adams (1800-1801). 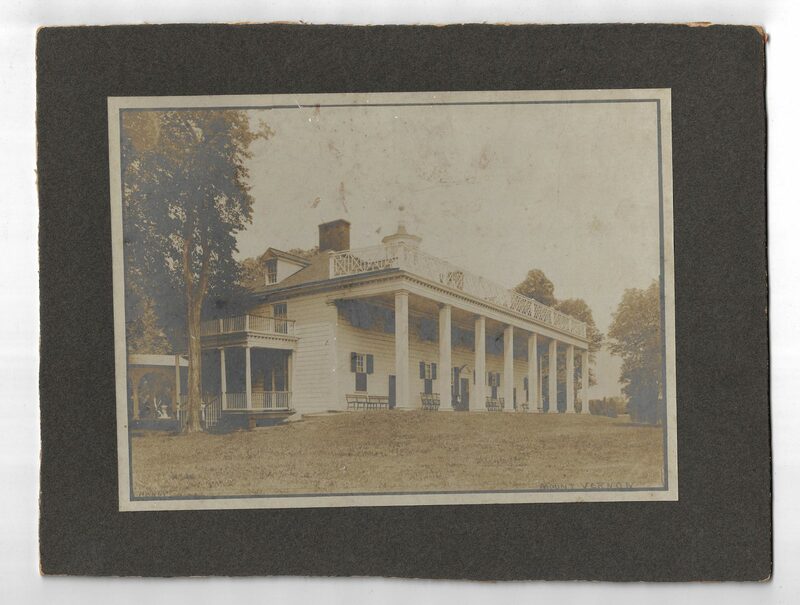 4th item: Albumen print of Mount Vernon, titled in pencil lower right and signed in pencil "Handy" possibly for Levin Corbin Handy (1855-1932), an American photographer who was related by marriage to Matthew Brady and apprenticed with him beginning at age 12. Image mounted on cardstock. Image – 7" H x 9 1/2" W. Cardstock – 9 3/8" H x 12 3/8" W. CONDITION: 1st item: Washington signature in overall good condition, slightly affected by pinprick holes. 1 1/4" x 1/4" area of toning, right side of paper (does not affect signature). 2nd item: John Marshall signature in overall good, strong condition, slightly affected by pinprick holes and areas of dampstaining. James K. Marshall pencil signature and inscription faint but visible. 3rd item: John Marshall signature in overall good, condition with areas of lifting to pen strokes, slightly affected by pinprick holes and foxing spots. 5/8" x 1/4" area of dampstaining, center right (does not affect signature). 4th item: Some grime and toning. Chipping to cardstock edges.